a book review by Rita Lorraine Hubbard: Next Stop—Zanzibar Road! Some picture books are written with a hidden moral or deeper purpose, but Next Stop—Zanzibar Road! by author and illustrator Niky Daly seems to have been written purely for fun. Zanzibar Road is apparently a very happy place to be, and Ms. Daly simply wants to make sure readers know it. 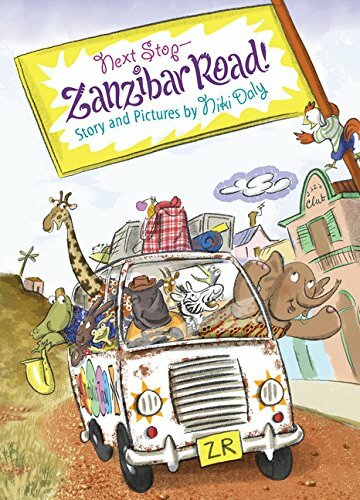 Set in a cozy village in sweltering Africa, this colorful picture book is the second in the Zanzibar series—the first was Welcome to Zanzibar Road—and it welcomes back an endless parade of quaintly animal neighbors with a host of human-like personalities. Children ages four and up will enjoy the adventures of Mama Jumbo, a kindly elephant with a son (called Little Chico) that just happens to be a baby chicken. Mama Jumbo takes a bus ride to her favorite bustling marketplace to do a little shopping, but when she runs out of money, she must use her wits to figure out how to get back home. Along the way, she meets baboons selling wooden beads, rabbits selling mirrors, and the flustered bus driver trying to figure out how to fix his flat tire. Mama Jumbo barters with each of these kindly animals to get what she needs to get back to Zanzibar Road. This picture book is not just entertainment for the very young, it is also a great teaching tool. Ms. Daly uses vivid descriptions like “Africa was as hot as a frying pan” to fuel young children’s imaginations. She uses very human situations, like when Mama Jumbo can’t get her floppy hat to fit just right, to show children that everybody has had a bad day at one time or another. And Ms. Daly uses emotional situations, like when Mama Jumbo decides her nose looks like “an enormous, fat sausage,” to help children understand that it’s normal to dislike oneself sometimes. This book makes a great pre-K and K–2 reader. Teachers can discuss the warm colors throughout to discuss the climate and landscape of Africa. They can also use the text to teach beginning social studies, culture and tolerance, the ancient art of bargaining/bartering, and even the benefits of learning to use your wits. If there is a negative side to this book, it may be that children will find it difficult to keep up with the unending cast of characters if they did not have the opportunity to read book one. But other than this, Next Stop—Zanzibar Road! should make a great addition to any child’s personal library.